Thanks to increasingly wacky weather patterns, most of the United States sees at least a dusting of snow once a year and, yes, that includes typically powder-free areas like Florida, Southern California, Texas, and Hawaii. In fact, the Big Island of Hawaii recently welcomed a winter storm that dropped about six inches of the white stuff on its higher elevations. Building an igloo in paradise — can you imagine?! 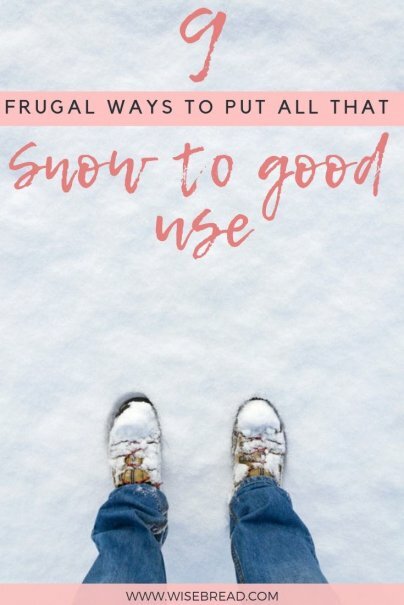 Besides building snowmen and having snow fights, here are several ideas to take advantage of your abundance of snow. Some may save you money, while others are just downright delicious. If you've never made snow ice cream (and I haven't; this is a tip from a friend), consider this very essential criteria: The snow must be fresh, clean, and untouched. I mean, you're going to eat it, so you'll want to steer clear of the yellow spots. Once you've identified a pristine area of freshly fallen snow, scoop up about eight cups or so, which you'll then combine with a quick-and-easy milk/sugar/salt/vanilla mixture. The author of the food blog Gimme Some Oven has prepared this recipe for snow ice cream that calls for sprinkles on top — because why not? Definitely gonna give this a try myself. If you're a little more ambitious, check out this recipe for maple syrup snow candy, which apparently is also quite popular. I don't know about you, but I have more food than I can fit into my fridge over the holidays and into the winter. It's mostly space-taking containers full of soup and other hearty dishes. I also store liquor outside during the winter — the hard stuff isn't in danger of freezing. To keep the animals away from my stash, I put everything in a cooler and pack the snow around it for safe keeping for as long as it lasts. Maybe it's the perpetual college kid in me, but when the news folk start yammering on about a major snowstorm that threatens to close down the schools, government, and roads for at least a day, I immediately start making plans for my icy bar crawl. That's just what you do as an adult on a snow day. I've even braved blizzard conditions to get to bars about half a mile away from my house on foot; that's how invested I am in this annual tradition. Just make sure you dress accordingly, of course. If you're not the adventurous type, you can still enjoy a snow-day libation celebration in front of your own fireplace with homemade adult snow cones. Rob Clement over at Fansided recorded a how-to video on making grown-up snow cones, which feature thawed berries, a couple flavor extracts, and a shot of bourbon. If you have down- or poly-filled outerwear, particularly the nylon and polyester variety, it's best to keep them out of the washer and dryer. They'll either get all mangled and lumpy from the wash cycle, or damaged in the dry cycle, and then you'll be SOL for the next storm. Instead, take them outside for a "snow wash." Grab a sponge or firm-bristled brush and use the clean snow to rid the items of winter schmutz, like dirt and salt stains. You can likely do this without a cleanser, but a dab of dish soap will work so long as you properly rinse the item once you're done and hang it to dry. I can't keep a houseplant alive — I honestly don't know what I'm doing wrong — but my friend and travel blogger/Huffington Post contributor Kevin Richberg knows a thing or two about botany. "Garden enthusiasts will shovel [snow] on top of all the delicate summer bulbs they're trying to overwinter in the ground because snow is the ultimate insulation against delicate plant tissue freezing in the soil." I don't suppose that'll work for my indoor dracaena? I asked a bunch of my friends how they would use snow to save money, and one of them said that he'd fill up his toilet with it. I had so many other questions after that — like why, for instance (he said to converse water) — but I eventually digressed and promised myself that I'd draw the frugal line at dragging a bucket full of snow up my steps just so I could do my business in it. Other people, however, have found more practical bathroom uses for snow — like Rosemary Clooney, who likes to wash her hands and face and hair in it… and then sing about it. If your hot tub or Jacuzzi is low on water in the winter because of all the half-naked people you're piling in it, take advantage of the snow by shoveling enough in to top it off so you don't have to turn on your outdoor faucet and use the hose. You should be turning this off in the winter to prevent freezing and pipe bursting, anyway. If you have any large containers, perhaps coolers or barrels or really anything with multi-gallon capacity that can be sealed, you have the perfect vessel to store melted snow for future use watering your plants, pressure-washing your house, or washing your car. This tactic could come in handy if your area faces a particularly dry spring and summer, or drought conditions that force water restrictions. You'll save at least a hundred bucks on cleaning your large wool rug by placing it outside for at least 30 minutes in temps well below freezing before scrubbing it with snow. Apartment Therapy provides further details on how to clean a wool rug with snow. Just remember to bundle up.